In the years that followed Lightfoot performed in coffee houses in Toronto. He got work as a performer on the CBC’s Country Hoedown and went to England to host the BBC TV Country and Western Show in 1963-64. At that time, Lightfoot’s songs were recorded by numerous recording acts. These included “Early Morning Rain” by both the Kingston Trio and Judy Collins, and “Ribbon of Darkness” by Marty Robbins. The attention Lightfoot got as a songwriter landed him a record contract with United Artists in 1965. In 1966 he was commissioned by the Canadian Broadcasting Corporation (CBC) to compose the “Canadian Railroad Trilogy” for a broadcast on New Year’s Day in 1967, the nations centennial. “Bitter Green” was Gordon Lightfoot’s fourth single to chart on Vancouver’s pop radio stations and his second to crack the top ten. Spin Spin had peaked at #25 in November 1966, and Go Go Round peaked at #16 in March 1967. “Black Day in July“, a song about the riots in Detroit in the summer of 1967, peaked at #6 in May 1968. “Bitter Green” was a song concerning a tragedy. Bitter Green is a place the woman in the song walked above the town. Since she walked there so often, the townsfolk gave her the nickname Bitter Green. She is full of tears and sorrow. For decades she waits for a man to return to her. There is speculation he was a sailor who died at sea or someone in prison. Eventually she dies. After her death a stranger comes to the town. Full of tears, he kneels at the churchyard where her grave is marked, recalling her kiss. Gordon Lightfoot was born in Orillia, Ontario. He studied music at McGill, the Faculty of Music at the University of Toronto and the Westlake College of Music in Hollywood, California. Lightfoot would end up as part of The Swinging Eight, a featured group on the CBC program Country Hoedown. 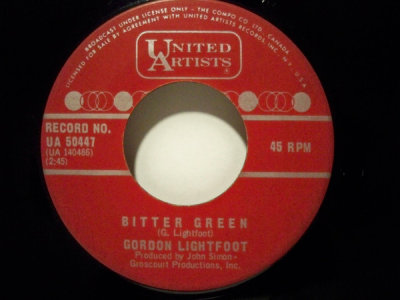 Bitter Green was the single release from Lightfoot’s fourth studio album, Back Here on Earth. It peaked at #5 in Vancouver, but only reached #44 on the national RPM Canadian singles charts. It did not chart in the USA. Lightfoot’s breakthrough in the USA was with “If You Could Read My Mind”. 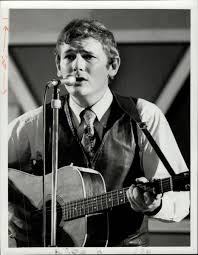 He went on in the mid-70’s to chart “Sundown” to #1 and “The Wreck Of The Edmund Fitzgerald” to #2 in the USA. (Both were #1 hits nationally in Canada). Between his initial breakthrough and later hits in the mid-70’s, there were three songs that did well in Canada but less well in the USA. These were “Talking In Your Sleep”, “Beautiful” and “You Are What I Am”. Gordon Lightfoot’s last charting single in Vancouver was “Daylight Katy” in 1978. Between 1966 and 2004 Lightfoot released 19 studio albums and 46 singles. In 1997, Gordon Lightfoot received the Governor General’s Performing Arts Award, the top honor a recording artist can receive in the performing arts in Canada. A tribute album to Gordon Lightfoot was recorded by many Canadian recording artists in a special release in 2003. In 2012 he performed the “Canadian Railroad Trilogy” at the 100th Grey Cup football championship between the Toronto Argonauts and the Calgary Stampeders. On Gordon Lightfoot’s website his tour schedule for 2018 lists all the concert dates booked for the year. Currently, his tour schedule provides details of 65 concert dates scheduled between February 13, 2018 and November 24, 2018, across 22 states in the USA and multiple dates in Ontario, Canada. Mike Sacks, Gordon Lightfoot Talks Sadness, Regret, and Maritime Disasters: In a Rare Interview, the Legendary Singer-Songwriter Discusses His Life’s Work, His Current Set List, and Why it No Longer Includes “For Lovin’ Me.”, Vanity Fair, New York, September 27, 2016. Martin Chilton, Gordon Lightfoot: The Queen Likes My Canadian Railroad Trilogy Song, Telegraph, London, UK, May 18, 2016. Joel Rubinoff, Gordon Lightfoot’s Harshest Critic Is Himself, Toronto Star, November 21, 2016.